Our little origamic architecture community site is definitely due for a makeover and, it is in the works. That's no excuse, though, for failing to mention that the new PopupCardShop has been online for a couple of months! Please check it out and, let me know what you think. Added links to Popup Workshop (popup card design software) and Ann Handicraft to the Other OA Sites page. Added links to the Extreme Cards Blog and the Wikipedia OA entry to the Other OA Sites page. I am catching up with a few minor updates. Added several placeholder entries for books I know exist (and little else) to the OA Books list. If you know more about any of them, please email me. I also added a direct link to the Pop-Up Card Designer Pro software, apparently the next version of Jun Mitani's 3D Card Maker software and, a link to Hector Ugalde's Spanish-language OA blog on the Other OA Sites page. I am excited to let you all know that a new origamic architecture pattern book has just been published. For more, check the entries in the OA Books list. I am pleased to be able to add some information on Hamid's beautiful OA-style pop-up books to the OA Books list. Bam Citadel: A Three Dimensional Commemorative came out last year. California Missions Volume 1 is now shipping and, volume 2 will be shipping soon, if it is not already. As far as I know, these are the first OA-style pop-up books (not pattern books) published. I finally tracked down a copy of Key to Origamic Architecture and have updated the description in the OA Books list. Added Jeff Rutzky's new book to the OA Books list. It's a good one. Check it out. Added several new links to the Other OA Sites page, including Hiroko's Pop-Ups Design Room, IKO Origamic Architecture Gallery, Papyromania, Ryu's Pop-Up Card Design Room, Tekuila Origamic Architecture Gallery and, Tjeerd Kuipers. Keiko Nakazawa's new book, 3D Pop-Up Greeting Cards, released in mid-September of last year, is now available through Amazon. There is a link on the Books page. Added a link to Carol Barton's book, The Pocket Paper Engineer: How to Make Pop-Ups Step-by-Step on the Books page. Victor Garcia has a new site. I have updated the link on the Other OA Sites page. The company that produces Professor Chatani and Keiko Nakazawa san's die-cut OA cards has ceased production of those cards. We have some stock of most of the designs in the Evermore Design catalog. So, if you have a collection to complete, now would be a good time. If you want more than a few cards, please contact me immediately. Update: This turned out to be somewhat inaccurate. The cards are still being produced but, there was a change to the distribution channel. They are still available through the Evermore Design Shop. Also, we have uncovered a supplier for the infamous Kent paper. Added Diego Uribe's book Fractal Cuts to the Books page. Posted an image of a recent holiday pop-up card design in the gallery section. Added a link to Kelly M. Houle's site on the Other OA Sites page. Added a description and corrected information for Pattern Sheets of Origamic Architecture, Vol. 2 on the Books. I also added the available information about Key to Origamic Architecture. Finally, I have found a few moments to update the Books page to reflect recent additions to my OA book collection. I added some missing books with short descriptions and notes on those, as well as some that previously had no commentary. I know that there are still one or two books missing from the list but, if you spot any errors or ommissions, please let me know. Added a link to Ingrid Siliakus' new OA website on the Other OA Sites page. Ingrid is a very talented OA artist and the new site, long in coming, has a lot of pictures of her work. Added a link to Hannah Biemold's new OA website on the Other OA Sites page. She has some really interesting designs. It is definitely worth the look. Be sure to check out the non-OA papercutting work, too! The International Reflections of Gaudi exhibition features Gaudi-inspired works from artists around the world. Among them are well-known origamic architects Marivi Garrido and Ingrid Siliakus. The exhibition runs from October 23rd, 2003 through January 17th, 2004 in the Montserrat cloister of the Sagrada Familia Temple in Barcelona, Spain. The new Hilltop Studios OA pattern ebook, Holiday Patterns, is now available. This brings the total 3 Hilltop books now available. There is a link on the OA Books page. Added links on the Other OA Sites page to Robert Sabuda's website and several other sites I discovered exploring that one (thank you, Mr. Sabuda!) Those include Bovine Designs, Ryutaro Sekiguchi, Victor Garcia, Yasser Mahgoub, and Yee. There's some great work on those sites. Check it out! Takaaki Kihara-san has a new website showcasing some fascinating origamic architecture pieces. The new site incorporates the old one and quite a bit of new material, including some animations and interactive animations. I also discovered a link to Professor Masahiro Chatani's elusive site. Follow the links on the Other OA Sites page for both new sites. Added a link to the order page for Hilltop Studios' new OA pattern book, Advanced Patterns Origamic Architecture, Volume 1 on the OA Books page. Check it out! Added a link to Takaaki Kihara-san's website on the Other OA Sites page. Added a link to Unique Projects: How to Make a Pop Up Origami Card on the Other OA Sites page. 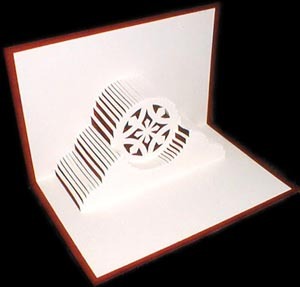 Added a link to Hung Hsin-Fu's 3D Paper site on the Other OA Sites page. Thanks to N. David Martin for bringing it to my attention. I added an image of an OA from Tour of Nara, Ancient Capital of Japan to the Gallery. We have moved to another new server to escape a failing telco. In the process, we upgraded to newer software for the OA Maillist. All previous subscribers are on the new list. I added a link to the Geomancy Cards site on the Other OA Sites page. The site is a hidden treasure. It has some fantastic OA designs, including the California Missons and reconstructions of some ancient buildings in the Middle East. It is not yet listed on the major search engines or anywhere else I have noticed. ... to that end, we are pleased to announce the addition of an Origamic Architecture section to the Evermore Design Shop on-line catalog. It features Ingrid Silakus' new book, along with a full English translation of the text. The book is in-stock and ready to ship. We are also offering a number of commercially produced cards designed by Professor Masahiro Chatani and Keiko Nakazawa and the elusive screw punch frequently sought by OA artists. Check it out now! Finally, we now have an improved gallery section with several new images. The OA Maillist is running again! Posted the latest OA Maillist archive. Maria Victoria Garrido has put some of her wonderful OA patterns back up on her site. Others are now available on CD-ROM. A direct link to the CD-ROM page has been added in the books section and the entry on the Other OA Sites page has been revised. Added a link to Brazilian pop-up card company Origami on the Other OA Sites page. The big news is the wonderful OA exhibit at the American Craft Museum in New York City (link on the Other OA Sites page.) If you are anywhere nearby, you owe it to yourself to go see it! I also posted a whole batch of updates: some updated URLs on the Other OA Sites page, quite a few new books, and the latest OA Maillist archive. Posted some updates to the Other OA Sites page and the latest OA Maillist archive. I added an image of a Masahiro Chatani OA of Uwajima castle Gallery section. I added an image of one of my favorite Masahiro Chatani OA designs, Papillon, in the Gallery section. Added an image of a card I made from a pattern in the latest OA book from Masahiro Chatani and Takaaki Kihara, Origamic Architecture Goes World-Famous Bulidings. The card, St. Giorgio's Cathedral in Venezia, designed by Andrea Palladio, is posted in the Gallery. I also added a link to Jun Matani's site on the Other OA Sites page. He has written a program to help design patterns for pop-up cards. The latest OA Maillist archive is also posted. I revised the links and alphabetized the OA Exit page. If there are any sites I have missed or any errors, please bring them to my attention. Added a link to Jagoda Djuran's OA pages on the OA Exit page. Added a link to Hilltop Studios on the OA Exit page. Although there isn't always an updated notification here, the OA Maillist archives are being kept relatively current. The Evermore OA site got a complete face lift this week. There was just too much stuff on the one page version, making it difficult to find anything. The site now includes revised subscription information for the OA maillist (the old address will still work,) maillist archives, an OA gallery with thumbnails, pictures of my "O-Deer" holiday pop-up card, recent scans of some really old pics of a 180-degree lotus card I did shortly after I first discovered OA, and a pattern section with patterns for the Evermon and O-Deer cards in Adobe Acrobat format. Comments, criticism, and questions about the new design are welcome. I added links to two new OA sites in the Link list: Marivi Garrido's OA Page and Baud et Bui. Both sites feature original designs, instructions, and downloadable patterns. Thanks to Gerry Stormer for bringing them to my attention. Check 'em out! I stumbled on an exhibition book (Stairs) that appears to have pieces done in the OA style. I have only seen a picture of one of the 10 pieces in the book, so far. The book was originally published in the early 1980s but, sold out quickly. Added an image of a simple OA I did for the opening of a friend's paper arts store, Ink It! We are now hosting an OA maillist. See below for subscription information. I made one of Chatani's designs, the Parthenon, for a friend's Birthday. I have a report that the cards are still available from Gallery 91. I've added some links to other sites with info on origamic architecture. If you decide to purchase one of these books, please use the links from this page. Amazon.com provides exceptional pricing and service and a small referral fee will be paid to support a local Japanese arts organization, Arizona Aikido. There was a two-page article in Omni Magazine a number of years ago. It includes a description of origamic architecture and some background on Masahiro Chatani, it's inventor. I have a copy of the article but, it is undated. It describes a contest, the deadline for which was January 15, 1989. The article includes a small pattern for White Stage [5.08KB], one of my all-time favorite pop-up card designs. Please note that Evermore Enterprises is not in any way affiliated with A.G. Industries, Gallery 91, or this offer. Also note that the article appears to have been published in late 1988 and we have made no attempts to verify this info.